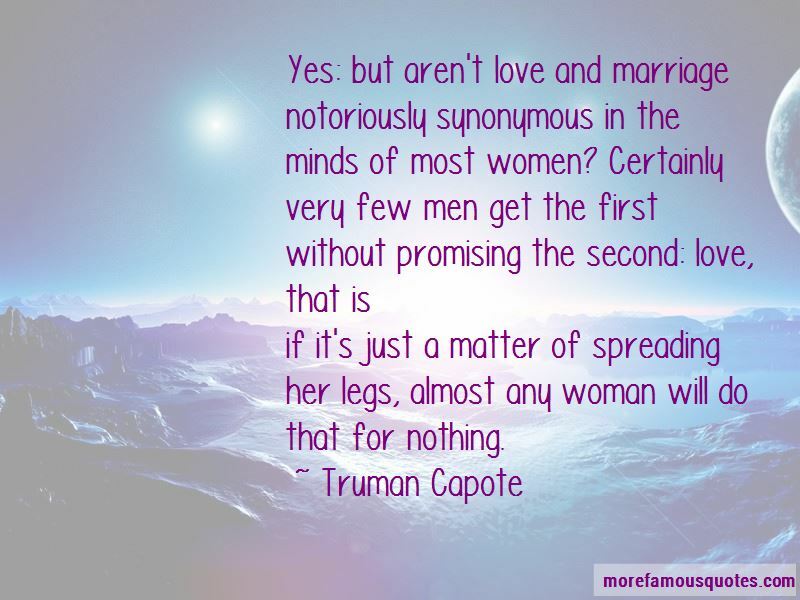 Enjoy the top 440 famous quotes, sayings and quotations by Truman Capote. “Never love a wild thing, Mr. Bell,' Holly advised him. 'That was Doc's mistake. He was always lugging home wild things. A hawk with a hurt wing. One time it was a full-grown bobcat with a broken leg. But you can't give your heart to a wild thing: the more you do, the stronger they get. Until they're strong enough to run into the woods. Or fly into a tree. Then a taller tree. Then the sky. That's how you'll end up, Mr. Bell. If you let yourself love a wild thing. You'll end up looking at the sky." "She's drunk," Joe Bell informed me. The blame of course belonged to Clyde, who just was not much given to talk. 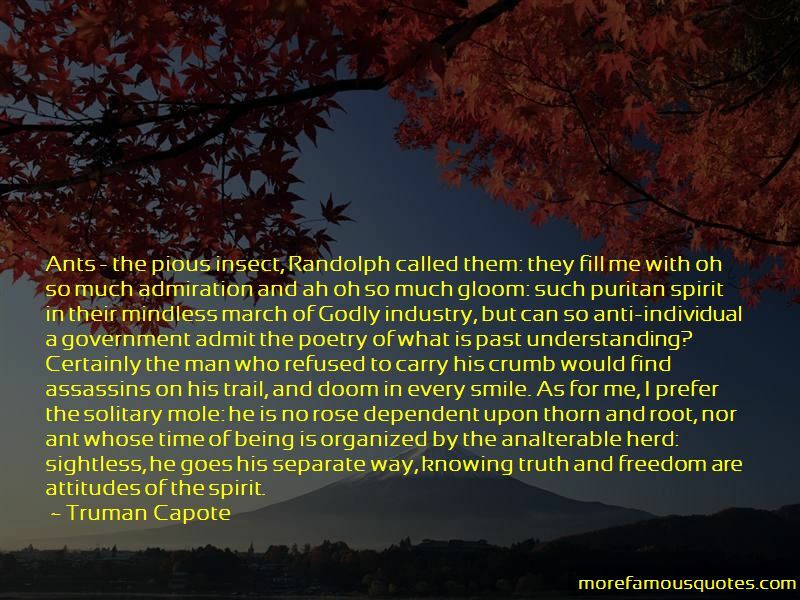 Also, he seemed very little curious himself: Grady, alarmed sometimes by the meagerness of his inquiries and the indifference this might suggest, supplied him liberally with personal information; which isn't to say she always told the truth, how many people in love do? or can? but at least she permitted him enough truth to account more or less accurately for all the life she had lived away from him. It was her feeling, however, that he would as soon not hear her confessions: he seemed to want her to be as elusive, as secretive as he was himself. The walls of the cell fell away, the sky came down, I saw the big yellow bird. and told, while Nye attempted to list them, of highways and hotels, motels, rivers, towns, and cities, a chorus of entwining names: Apache, El Paso, Corpus Christi, Santillo, San Luis Potosi, Acapulco, San Diego, Dallas, Omaha, Sweetwater, Stillwater, Tenville Junction, Tallahassee, Needles, Miami, Hotel Nuevo Waldorf, Somerset Hotel, Hotel Simone, Arrowhead Motel, Cherokee Motel, and many, many more. He gave them the name of the man in Mexico to whom he'd sold his own 1940 Chevrolet, and confessed that he had stolen a newer model in Iowa. On the opposite bank, a hummingbird, whirring it's invisible wings, ate the heart of a giant tiger lily. “She spent the rest of the way home despising New York: anonymity, in virtuous terror; and the squeaking drainpipe, all-night light, ceaseless footfall, subway corridor, numbered door (3C). “114I'll wager at the very end a body realizes the Lord has already shown Himself. That things as they are "
"just what they've always seen, was seeing Him. As for me, I could leave the world with today in my eyes." I got this idea of doing a really serious big work-it would be precisely like a novel, with a single difference: Every word of it would be true from beginning to end. Champagne does have one regular drawback: swilled as a regular thing a certain sourness settles in the tummy, and the result is permanent bad breath. Really incurable. 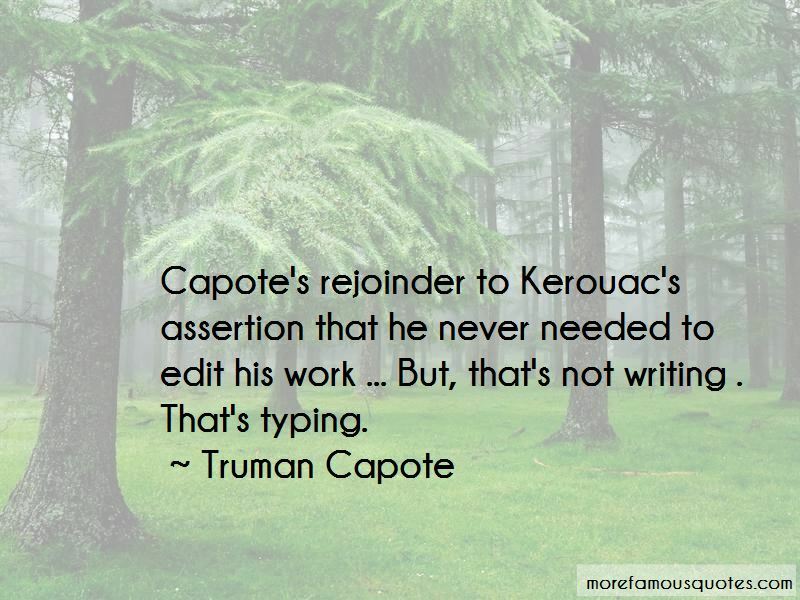 Want to see more pictures of Truman Capote quotes? 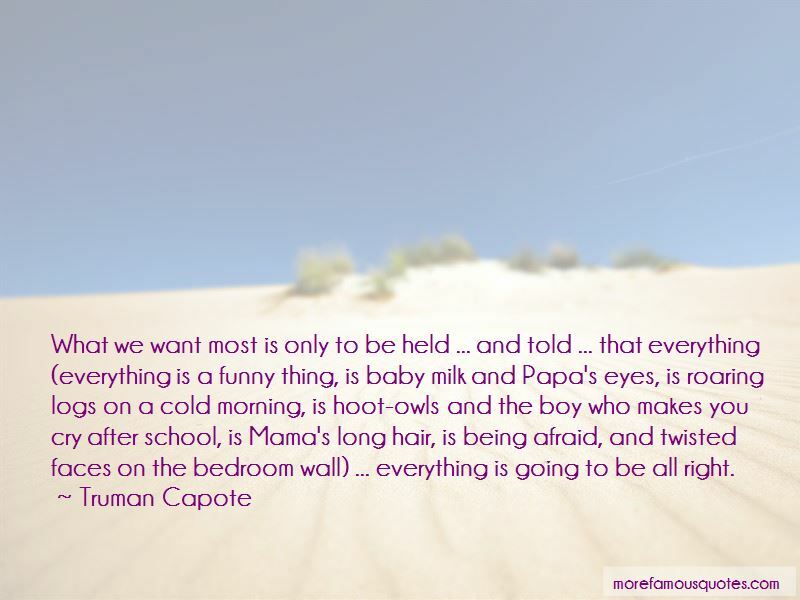 Click on image of Truman Capote quotes to view full size.